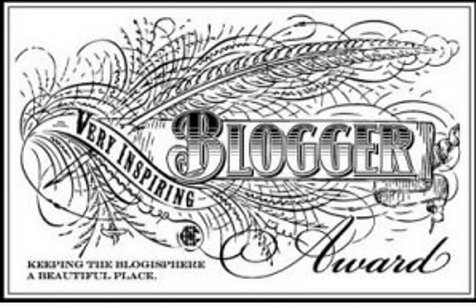 Apparently… I’m pretty inspiring… so much so that I was awarded with the Very Inspiring Blogger Award. To be honest, this came at a complete surprise. I started this blog last year as a simple way to grow in my faith. I figured the more I blogged, the more I would dive in to God’s word.. it was really all for me and then I found out that other people were actually reading it. And not just my mother (even though she’s my number one fan). As I began more and more accustomed to blogging, I decided to incorporate my photography business into this same blog. Some would criticize that you shouldn’t mix your faith with your business… but I say.. I have nothing to hide.. or to be ashamed of. My faith is a HUGE part of who I am and I’ve never really understood the purpose or benefit of separating my faith from the rest of my life. It is who I am. So, I have this blog… a little photography, a little faith, a little family, a little bit of my life. And apparently it seems to be inspiring to some of you and that makes my heart overflow. However, I’m not sure I really fit the bill for being inspiring… I see it more of God working through me to work through others. Many of you have mentioned in the past how I’ve written a post that really spoke to you and came at the perfect time. Well, that’s not me. That’s all God. I give Him all the glory… for this blog, for my business, for the purpose and hope I have in life and for the reason you all seem to find me inspiring. With all that said.. It’s such an honor to be considered inspirational by someone, especially someone with a story and testimony like Matthew over at Cleansed by God. Geez. Talk about a transformation story! He definitely has a story to share, so be sure to check out his blog! So, now there really isn’t a next step for the award except for telling a little about myself and my blog and sharing other blogs with all of you that I have found inspiring over the years. Some relate to the Christian walk while others focus on the world of DIY and some are photography blogs. No matter the topic, these blogs and the writers behind them have given be some inspiration and some hope for something more. Make sure you check these guys out… or bookmark this page and come back to it later. I have a passion for working with youth and hope to make that passion a reality in the near future. Divorce is simply not an option for me, but Tim Tebow would be the man I turn to if it ever happened. Thanks to my father, I know way more about football than any average girl should in their lifetime. And thank goodness I’m not average.. because I love every bit of it! Fantasy Football anyone?!? Go Steelers! Go Irish! More than anything else, I love photographing newborns. They just bring so much joy to my heart (probably because I have major baby fever). My husband and I watch way too much tv for our own good… thank goodness for DVR. I spoil my puppies more than most people spoil their children. Is there such thing as too many kisses? I’m a bit of a nerd, but hate reading. If it wasn’t for all the reading, I would have been a lawyer. Okay! I think that’s twenty.. more than plenty of options to find some inspiration. So, whether you are looking to soak up some of God’s love, get creative with your sewing machine or dive into a new project around the house… I think this list has you covered. And if you’re still left inspiration-less, find me on pinterest at http://pinterest.com/kristina_kerns/ – you’ll be sure to find some pin-speration there! There’s a little bit of photography and design, yummy recipes, ideas for the holidays, family-centered activities, hopes my church, ways to improve my home, quotes, humor and so much more! Follow me there for even more inspiration in your life!